Gum arabic is obtained from the sap of the Acacia trees found in the belt of arid lands in Africa, including countries such as Sudan, Nigeria, and Chad. Gum arabic can be used to perform various functions and has numerous applications in the food & beverages industry. Gum arabic is used as a binding agent to bind the food particles together, while retaining their physical properties. It is used in a variety of food products, such as gums, pastilles, toffees, and cola-flavored beverages, for stabilization and emulsification. The global market has been segmented on the basis of application into confectionery, beverage products, bakery products, dairy products, and sauces & dressings. The market has been further segmented on the basis of type into Senegalia Senegal gum and Vachellia Seyal gum. On the basis of function, the market has been segmented into thickener, fat replacer, stabilizer, gelling agent, coating agent, and texturant. The market has also been segmented on the basis of regions into North America, Europe, Asia-Pacific, Latin America, and Rest of the World (RoW). The gum arabic market is projected to reach a value of $800.3 Million by 2019. In 2014, the market was dominated by North America, followed by Europe, in terms of consumption. 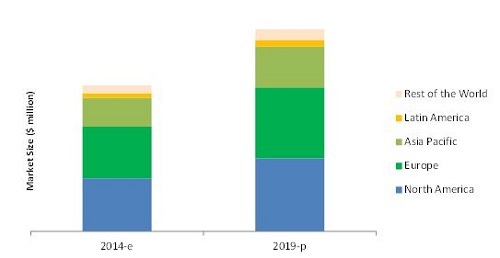 The Latin American market is projected to grow at the fastest CAGR, owing to the rapid growth in the gum arabic markets of developing countries such as Brazil and Argentina. Furthermore, the growing awareness about multi-functionality of gum arabic and the associated medicinal benefits of gum arabic are also driving these markets. This report includes market sizes in terms of value ($million) and volume (MT). Bottom-up and demand-side approaches were used to arrive at the market sizes and obtain the market forecast. Extensive secondary research was conducted to understand the market insights and trends, which were further validated through primary interviews. The report provides both qualitative as well as quantitative analyses of the market, along with the competitive landscape and the most preferred development strategies of the key market players. The key players were observed to prefer new product launches & developments, acquisitions, agreements, and expansions as strategies to garner a large share in the market. The report also analyzes the market dynamics, winning imperatives, and issues faced by the leading market players. The research study categorizes the market on the basis of type, application, function, and region. The gum arabic market is fueled by the growing awareness about the multi-functionality of gum arabic and the associated medicinal benefits. Globally, the multiple functions of gum arabic to enhance the quality of the food products have led the large-scale adoption of gum arabic in various applications. Gum arabic also exhibits some medicinal benefits, such as reduction in dental plaque and healing of wounds, which are encouraging the application of gum arabic in the pharmaceutical sector, thereby driving the growth of the global market for gum arabic. The market for gum arabic is estimated to reach $800.3 Million by 2019, at a CAGR of about 6.7% from 2014 to 2019. The global market has been segmented on the basis of application into confectionery, beverage products, bakery products, dairy products, and sauces & dressings. The market has been further segmented on the basis of type into Senegalia Senegal gum and Vachellia Seyal gum. On the basis of function, the market has been segmented into thickener, fat replacer, stabilizer, gelling agent, coating agent, and texturant. The market has also been segmented on the basis of regions into North America, Europe, Asia-Pacific, Latin America, and Rest of the World (RoW). This report includes market sizes in terms of value ($million) and volume (MT). 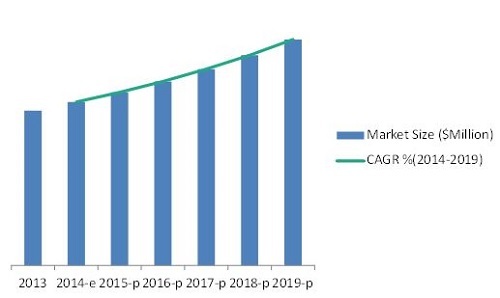 The market for gum arabic is projected to grow significantly in the coming years owing to the increasing use of gum arabic in different applications and the rising opportunities in countries, such as India, China, Italy, and Brazil. In 2014, the North American region dominated the global market for gum arabic. The market in Latin America is projected to grow at the fastest CAGR during the forecast period. The market is fragmented and competitive, with a large number of players operating at regional and local levels. Over the past few years, the key players in the market have adopted new product launches and expansions as their preferred strategies to strengthen and sustain their positions in the global market. The key players of the market include Gum Arabic Company (Sudan), Nexira (France), TIC Gums (U.S.), Kerry Group (Ireland), and Alland & Robert (France), among others. *Details on Business Overview, Product Portfolio, Financials, Related Developments and MnM View Might Not Be Captured in Case of Unlisted Companies.